I don’t know about y’all but it feels like lately we have been eating out more than usual and it is usually the same old haunts every time. This is probably a result of my back injury and my wife being out of town on a semi regular basis for the last few months. It is also partially my fault because I mainly eat American and Italian foods and it’s easy to stick with what you know. I am not a fan of beans or rice really and try to stay away from spicy foods so it eliminates alot of options. So to try to help spice things up, I am looking for something different than my regular haunts. Any suggestions out there? Preferably in Howard County, but anywhere in the close proximity would be fine. If you follow my blog on its somewhat regular basis, you will know that I am certainly a fan of pizza! 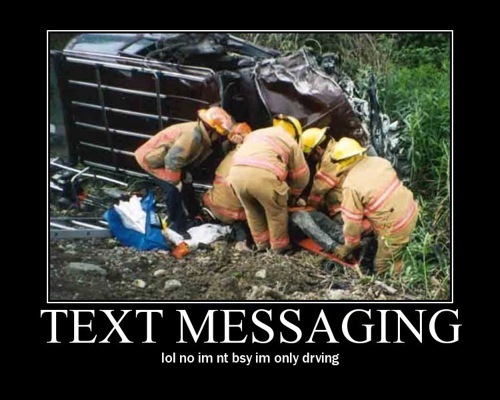 has anyone noticed that everyone is still texting while driving? la st year, maryland took the first steps into the giving out fines for texting while driving, but it was a secondary offense so no one really cared. now this year, back in october, the new texting law went into affect and yet everyone is still texting while driving. on a daily basis, i see lots of people texting while driving (myself included on occasion). the most interesting person i’ve notice that are texting while driving is the police. all levels of police, local, state, auxiliary, etc. and all the time. i guess no one, including law enforcement, still cares about the new texting while driving law in maryland. Drivers who are ticketed can still choose to accept guilt and pay a $70 fine (plus one point on their license). If the texting leads to an accident, accepting guilt means an automatic $110 fine and three points. Drivers who contest the tickets and lose in court will be guilty of a misdemeanor and have to pay the full $500. guess everyone will just plead guilty and not care about the fine/point if they get caught? i’ll pass. not worth the point or the fine. oh yeah, and don’t forget to watch out for new speed cameras in Howard County! locations are listed on the police website and it’s a $40 fine if caught. But not together. Last week my wife was out of town ruling the world and doing a great job at her job. Meanwhile, I was home making the bacon as we like to joke especially since she doesn’t eat bacon. Sometimes on my off Fridays I will catch an early movie and this past Friday, I caught Tower Heist. It stars Ben Stiller, Eddie Murphy, and a host of other characters. It’s a cross between a comedy and a heist movie. The basic premise is the same as the Bernie Madoff case. The Madoff like character doesn’t sell any of his assets and gets to say in his apartment on house arrest. Ben Stiller’s character and his co-workers break into the apartment and the movie continues from there. It was probably a B movie. Entertaining and some what light hearted but semi serious at other times. Meanwhile after a week of dinners out, I continued my gluttony and caught dinner at a new pizza place for me called Pazani. It was suggested here on my blog and since we all know I love pizza, I went and checked it out. It’s off of Marshalee Dr. by Timbers of Troy Golf Course. The restaurant is a nice family friendly atmosphere and is like Trattoria da Enrico or many of the other local pizza places; however, they have a larger selection and a catering menu. The restaurant was a little smaller than I had expected from looking at the menu and there were about 5 or 6 other groups there, mostly with families, and they filled up the majority of the restaurant. Anyway, I got the small pizza with sausage… a standard for me. It was pretty tasty and had a nice crisp crust. It seemed a little greaser than some other places but it didn’t really sway me away from going back if I am in the area. As a lone wolf that night, I enjoyed my pizza and caught a look at what others were eating. Many people had different varieties of pasta meals which also looked good and others of course had pizza. One group had the calamari which was a generous portion and others had the cheese steak and salads. The regular menu and the catering menu had a large selection so you could go often and get something different to eat there or for a party at your house. I will definitely go back again. Also, thanks to @howchowblog for linking to my other pizza article earlier in the week. It’s interesting living in the same community that you grew up in. Although I grew up in Ellicott City and now live in Columbia, we all visit the same places because it’s essentially one in the same in Howard County. Lately, I’ve seen alot of the people I grew up with. I ran into an old high school friend at Bagel Bin two weeks ago when I was grabbing breakfast randomly on my day off. Then this past Saturday I saw another old friend at the Columbia Mall and we were reminiscing about when we came to the mall as kids and it was the cool thing to do. Now it sometimes seems more like a chore. Interesting how things have changed. She also has 3 kids so things have really changed from when we middle schoolers riding the bus to school. My mom even went to a baby shower for an old friend of mine whose wife is having their first child next month. All of our close friends’ moms were there updating everyone on each others kids so in less than 2 weeks, I’ve gotten updates on half of the kids I grew up with. With that and my lifelong best friend living in DC, it is a small world. Unfortunately our 10 year high school reunion got cancelled so I will just have to see all those other kids around town instead. Are you a “to do list” person? I am not really a big one myself but know lots of people who are. With the Droid, you have the built in to do list widget and I use it mostly for notes, although it has one thing to do on it. Blog more. That’s my to do list. I am not a person who needs a list to remember to fold the laundry and clean the house. Those are things that I would think that you do on a regular basis. I don’t even make a list of things I need to do at work unless something is overly important. Maybe it’s too much rigor for me, I don’t know but I don’t feel like it fits for me. What about you? I am going to work on mine and blog more (assuming I remember).